(Bloomberg) -- Jim Chanos has made a career on Wall Street out of betting against the crowd. In basketball, going with a favorite made him a winner. Chanos, the short-seller who runs Kynikos Associates, correctly picked a No. 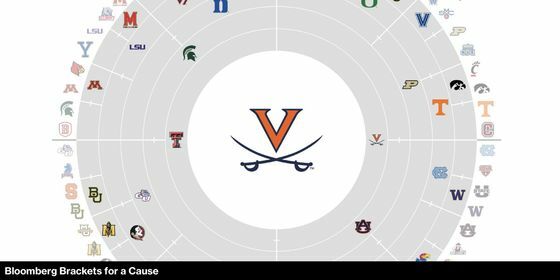 1 seed, University of Virginia, to win this year’s NCAA Basketball Tournament, giving him the victory over fellow Wall Street titans in Bloomberg’s Brackets for a Cause. He got 48 out of 63 picks right -- including three of the Final Four -- for 174 points, outpacing Bruce Flatt, Brookfield Asset Management Inc.’s chief executive officer, with 167 and Tudor Investment Corp. founder and UVA graduate Paul Tudor Jones with 160. Participants donated $10,000, with the total pot going to the charities of the three with the most accurate brackets. Chanos chose Médecins du Monde-Greece, Flatt was playing for Project Destined in the Bronx and Jones’s charity was Robin Hood, the anti-poverty group of which he is a co-founder. Virginia had a couple nail-biters to get to the final, where it beat Texas Tech 85-77 in overtime Monday to win its first NCAA tournament. Virginia and Duke were popular choices in the contest, with two-thirds of competitors picking one of the Atlantic Coast Conference blue bloods. Michigan State knocked out Duke and freshman star Zion Williamson in the round of eight.